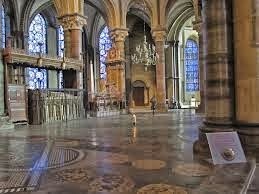 This is a picture of the site where Thomas A Becket's shrine was in Canterbury Cathedral. Pilgrimage was an important part of life in medieval times and Becket's shrine was the most important in England. 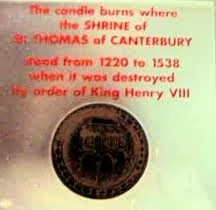 Thomas A Becket once a great friend of King Henry II was made Archbishop of Canterbury by the King and their relationship changed with the archbishop soon at odds with the the King on many matters of state and religion. In a fit of rage Henry declared he wanted rid of Becket. Four over zealous knights rode to Canterbury and murdered Becket in his cathedral. Soon the tomb was said to produce miracles and it became a religious shrine. Henry regretting his outburst did penance at his old friend's tomb. Geoffrey Chaucer brought medieval pilgrimage alive in his Canterbury Tales which are still famous today. Becket's tomb was destroyed in Henry VIII's dissolution of the monasteries. My fascination with Chaucers Canterbury Tales and many visits to Canterbury Cathedral to visit the tombs of many of our monarchs inspired me to write my historical romance LURE OF TREVOWAN. Available from this weekend new kindle ebook in the Women of Chivalry historical romance series. LURE OF TREVOWAN. A HAUNTING MEDIEVAL ROMANCE IN THE TIME OF HENRY V. INTRIGUE, PASSION, SUSPENSE AND RICH IN ATMOSPHERIC TENSION DURING A PILGRIMAGE TO BECKET''S SHRINE AT CANTERBURY. Following the death of her father, Lady Alynna is cast out of her family home. Stripped of rank, fortune and identity she resolves to discover the truth of the mystery surrounding her birth. Championed by Richard Dreux, a handsome enigmatic pilgrim she journeys to Becket's shrine in Canterbury. A jester and a scarred cripple are her companions - the pilgrim her self appointed protector. But what dark secrets haunt him? Alynna also has her secrets and her past cannot be escaped and shadows her future happiness. Only the Earl of Trevowan can save her, but having lost her heart to the humble pilgrim can she surrender to the powerful Lord Trevowan's will?